This past NHL offseason, the Toronto Maple Leafs had a lot of work to accomplish. They started by revamping their coaching staff and adding new head coach Mike Babcock, arguably the biggest addition they made. He’s known as a man who expects hard work and nothing less. He’s a coach that will push the players under him to be the best they possibly can. Having Babcock as head coach makes it a big season for a few Leafs players. Some have chips on their shoulders and need to perform well. Others are young and up and coming and are looking to take a bigger leadership role within the team. Three in particular caught my eye as players who are ready to have a breakout season. In each of his first two NHL seasons, Morgan Rielly has been nothing short of impressive. Commentators and media personalities regularly use words such as poised and dynamic to describe the young defenseman when he steps on the ice. The former Moose Jaw Warrior has been wowing Maple Leafs fans since he first made the team a couple of years ago. Whether it’s his speed, skating or offensive outbursts, Rielly has quickly become a fan favourite as well as one of the teams brightest young stars. He finished last year with 8 goals and 29 points in 81 games. That ranked him third in scoring among defensemen on the team, trailing only captain Dion Phaneuf and the now departed Cody Franson. Rielly continues to improve as his NHL career progresses. Next year, with added responsibility and the addition of Mike Babcock to teach and push him, Rielly could see himself become the leading scorer among Maple Leafs defensemen. Babcock has been able to coach many successful defensemen in his career including Brian Rafalski, Chris Chelios and of course Nicklas Lidstrom. With all those past experiences, Reilly is certainly in good hands. Holland was acquired by the Leafs from the Anaheim Ducks at the time when the Buds desperately needed a centre. Each season he has seen his games and playing time increase. Last year, he became a serviceable third option behind Tyler Bozak and Nazem Kadri. 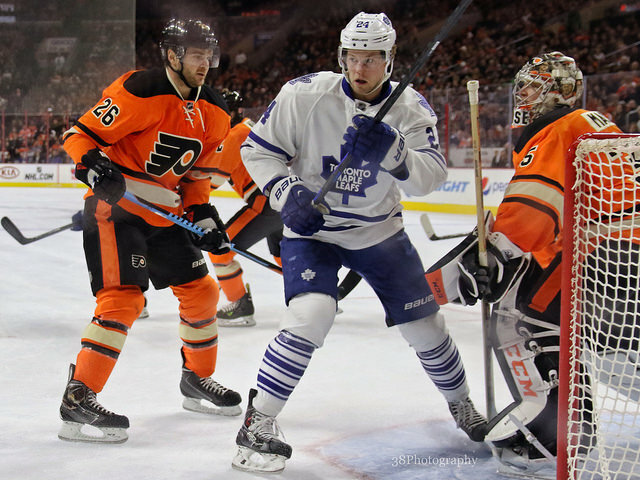 Under Babcock, Holland will get a chance to demonstrate that he deserves a bigger role with the top six forwards. he has a penchant for coaxing the best out of his players, and Holland is just one name who could instantly benefit from the added confidence and teaching. Holland had 11 goals and 25 points in 62 games last season. He only suited up for 62 games due to an unfortunate bout with lace bite that kept him on crutches. Holland is due to breakout in a big way this season. He’s shown glimpses of the player he can become and this year should afford him the opportunity and playing time he needs to really showcase his skills. He also might get a chance to play with a familiar face, as the Leafs brought in Taylor Beck for the upcoming season. Beck and Holland were junior linemates in Guelph and went out and put up spectacular numbers together. Instant chemistry is a good thing, and it could be the push that Holland needs to really come into his own. "Last year was a huge year for Nazem Kadri, this year is going to be even bigger" @JeffMarek on @ItsDeanBlundell & Co. If there is one player who needs to have a breakout season next year, it’s Nazem Kadri. The former London Knight was given a challenge for the upcoming campaign. That challenge was delivered in the form of a one-year contract worth $4.1 million dollars. Management’s position is crystal clear: Kadri needs to show that he can play consistently and put his off-ice issues behind him. If he can stay focused and perform well, he’s in line for a nice payday with his new contract. He had 18 goals and 39 points last year. Management, the coaching staff and fans are hoping Kadri can match and then eclipse his stats from 2013-14, where he had 20 goals and 50 points. Babcock believes Kadri has the potential to be among the elite centremen in the NHL today. In order to prepare for those expectations, Kadri has been working extremely hard this offseason. The former Red Wings bench boss will be on him the entire season. I believe that is what Kadri needs in order to excel. He could also give him some insight into how some of the leagues best centres work, such as Pavel Datsyuk, the longtime superstar in Detroit. It’s safe to say this will be the biggest challenge of the former first round pick’s career.